Rovinj is known as the most romantic place on the Mediterranean. The Rovinj region stretches from the Lim Bay to the town of Rovinj. 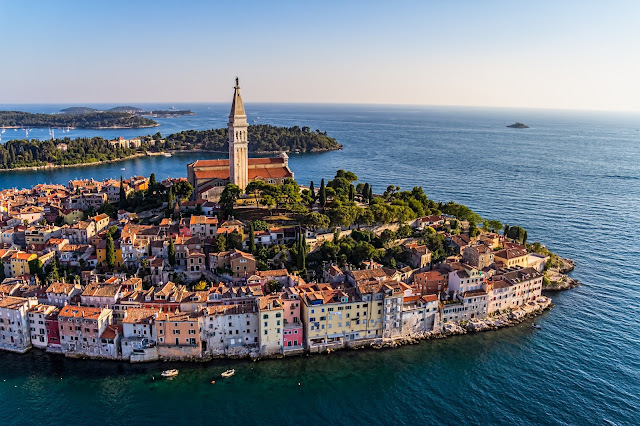 With a stunning natural heritage, beautiful landmarks, expansive coast, and protected islands, Rovinj continues to draw millions of visitors from all over the world and is the most popular destination in Istria. - Bale: Nearby village that dates back to 983. See the Soardo-Bembo Palace from the 15th century and have a coffee at Kamene Price Jazz Bar. At Colone Cove near Bale a site of fossils belonging to several species of dinosaurs has been discovered. 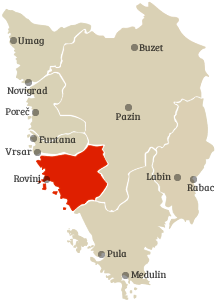 - Kanfanar: Kanfanar is best known for the St. Jacob’s day in July when Istria selects the most beautiful Istrian ox (Boskarin). Perched on the central western coast of the Istrian Peninsula, Rovinj was once an island. The channel separating it from the main peninsula was filled in during the mid-1700s connecting it to the mainland. Twenty-two tiny islands continue to welcome visitors to this very Venetian town, sporting a distinctly Italian vibe. From its early Illyrian heritage, Rovinj endured rule by the Romans, the Byzantines, the Franks, then the Venetians, who ultimately built walls and gates for protection against intruders. The 18th century fall of Venice opened the door for Napoleon, followed by Austria and Yugoslavia. This lovely fishing village and tourist town also provides education, research, and medical treatment in the Center for Marine Science, Center for Historical Research, and the Martin Horvat Orthopedic and Rehabilitation Hospital. This beautiful, compact town makes for a wonderful walk among its sites. The St. Euphemia Church in the town center, with its bell tower, is a must see, along with the fabulous market, the square at the bridge, The Batana Boat MuseumEco-Museum, and the Balbi Arch, crowned by a winged lion, a Venetian artifact. From the hill forts echoing the Bronze Age, to the wine bars, concerts, modern hotels, and busy markets today, Rovinj remains a relaxed, inviting, romantic destination for visitors and residents alike. - St. Euphemia Church: Dates back to 18th century. Located on the highest point of Rovinj. Relics of St. Euphemia are kept inside the church. - Old Town: Classical architecture with narrow streets, cozy shops, and cafes. Rovinj’s most famous street is Grisia, a narrow pedestrian alleyway. - Golden Cape forest park (aka Punta Corrente and Zlatni Rt. ): One of the most important natural parks of Istria. Visit the park for its many stony beaches and amazing views. - Batana Eco-MMuseum: This museum is dedicated to the famous flat-bottomed fishing boats made in Rovinj. You can book package deals on Tuesdays and Thursday to attend the museum, go on a batana boat ride, and have a light dinner. - Heritage Museum: Paintings from as far back as the 15th century. - Rovinj Port: Wonderful port and an interesting sightseeing spot in St. Euphemia Church. - Palud: Ornithological reserve with more than 200 bird species. - Franciscan Monastery: Built in 18th century Baroque style. - St. Katarina Island: See Rovinj from another angle, especially during sunset. - St. Andrija Castle: Castle built between the sixth and the 17th century, currently used as a hotel on a nearby island. - Crveni Otok: Also known as Red Island, this is a nice getaway from the coast. - Histria Aromatica: Native medicinal and aromatic plants park. - Rovinj Aquarium: Aquarium dates back to 1891. - Lim Bay (aka Lim Channel and Limksi Kanal): 9km karst channel with huge rock walls. - Dvigrad: Dvigrad dates back to Bronze Age and was demolished by the Venetian army in the 14th century. The defensive walls, towers, and palace ruins are still visible. The town was deserted in 1630 due to a plague and raids by pirates. Legend has it that Captain Morgan hid some of his treasure in Dvigrad. Near Dvigrad, you’ll also pass the village of Mrgani where Captain Morgan and his crew settled. - Baron Gautsch: Well preserved and among the most beautiful shipwrecks. - Legend has it that the there’s also an island of Cissa underwater nearby, the Rovinj Atlantis, which sank during an earthquake in the 6th or 7th century and whose inhabitants fled and founded Rovinj. Although its existence has never been proven, Cissa is still alive in the stories of local fishermen who have caught fragments from the island around the place Cissa once existed. - Rovinj Day: The feast day of the City's patron saint, St. Euphemia, celebrated in the middle of September is one of the greatest folk festivals in Istria. - Grisia Annual Arts Festival: One-day art competition exhibition held each year in August since 1967 that has artwork from renowned and amateur artists. - Croatian Summer Salsa Festival and Summer Sensual Days: Week-long music festivals held back-to-back in June, with multiple artists and DJs, concerts, and parties. - Accommodation: Hotel Adriatic, Hotel Lone, Hotel Monte Mulini, Villa Meneghetti, Hotel Park, Family Hotel Amarin, Island Hotel Katarina, and Hotel Eden. Additional information about Rovinj is available at Rovinj Tourist Board.